Rediff.com » Sports » Ronnie O'Sullivan shows why he is called Rocket! Ronnie O'Sullivan shows why he is called Rocket! 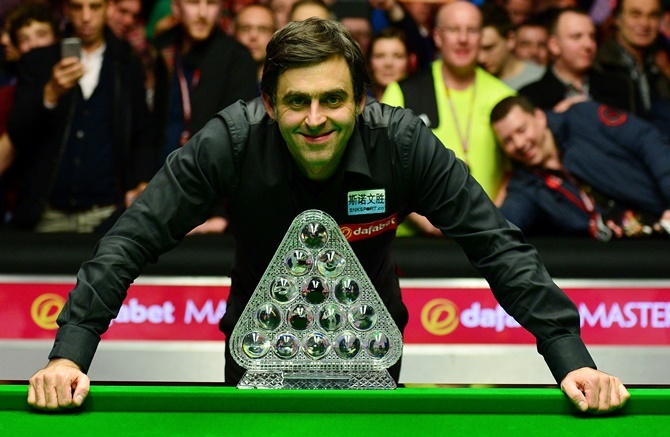 Ronnie O'Sullivan showed why he is called Rocket as he earned a record-equalling sixth Masters title by thrashing Barry Hawkins 10-1 in the final at London's Alexandra Palace on Sunday. O'Sullivan, 40, had not played in a major tournament since last year's world championship but there was little sign of any rustiness as he joined Stephen Hendry on six Masters titles. "I'm over the moon," the five-time world champion told the BBC after lifting the trophy with the biggest winning margin in a Masters final since Steve Davis' 9-0 victory in 1988. "I'm delighted I've been able to play as well as I have done. I'm never normally surprised that I win tournaments but I'm surprised I've won my first one back in eight months." Hawkins, who won the opening frame before losing to O'Sullivan for the 10th time in a row, added: "I wish he would retire, to be fair! I didn't give him a game today at all." World number six O'Sullivan had beaten world champion Stuart Bingham 6-3 to reach the final while fellow Englishman Hawkins, ranked eighth in the world, shocked Judd Trump 6-4. It was O'Sullivan's first televised tournament since he lost to Bingham in the quarter-finals of the worlds in April. 4 reasons why tennis is ripe for match-fixing!